If you've read my book you'll know that the Manly Food Co-op and I got off to a rocky start. What is up with all these bins? Am I really meant to bring my own containers? What do all the different prices mean? And how much did I just spend on olive oil (while distracted from the beautiful Brazilian checkout boy)? Fast forward 8 years and I am a Manly Food Co-op pro (it helps that it moved to a larger, brighter, swankier space). My husband and I can collect our containers from home and do a "big shop" in about an hour - including getting all the beautiful organic, local, packaging-free ingredients for two flavours of homemade muesli, stocking up on pantry essentials like rice, legumes, and nuts, and gathering whatever produce strikes our fancy. Ty has volunteered off and on over the years, and this year I've been volunteering as Director of Sustainability. We honestly don't know what our lives would be like without the Co-op. Unfortunately we may soon face the reality of a life without the Co-op and the sense of community it brings us. 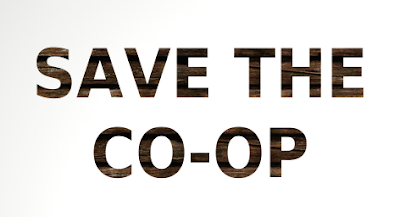 The Manly Food Co-op is facing closure if we don't raise $50,000 (AUD) by 20 August. That's just over a week from now! The details of why we need that amount and what it will be used for are on the Pozible crowdfunding site, so I won't get into it here. What I do want to say here is how important I think places like the Co-op are for building community and for offering the potential to radically change our food system. When the Co-op was founded over 21 years ago by Keelah Lam and other local environmentals, they had a vision to offer clean, affordable food to the Manly community that was better for the planet and better for people's health. Those same values drive the Co-op today, and are as important as ever as governments and corporations seem hell bent on keeping polluting, wasteful practices as the norm. If you watched the War on Waste and saw the latest report about how some of our recyclables only get recycled 50% of the time you will know the importance of avoiding packaging in the first instance. As we like to say at the Co-op, we never had to ban the plastic bag, because we never used it in the first place. In addition to waste avoidance - and pollution avoidance (and health benefits) of buying organic - the community of the Co-op has enormous revolutionary potential. As I've been writing about in my thesis lately, the way to change practices (like grocery shopping) to be more sustainable is not to focus on individual behaviour change, but to focus on creating networks and building connections. Building networks provides emotional support, but also supports multiple ideas to come together to start to change the system itself, which then enables everyone to have a more sustainable shopping experience. This week I've been blown away by the passion of the fundraising committee - including my husband. It seems I have fallen even more in love with him this week (had no idea that was possible!) as I've seen his fighting spirit come alive, and heard him speak with tenderness of the love he feels for the Co-op as he contacts some of the 600+ Co-op members to raise the funds to save the shop. In less than 2 days they have raised over $12,000. I have witnessed the power of community, the power of this network, as it is rallying together to save an institution they love. If you are passionate about stopping food and packaging waste, supporting organic farming, and the idea of changing the food system to be more sustainable, equitable and healthy, can I ask you to do me a favour and donate to the Manly Food Co-op fundraising campaign? If you are a local, you can contribute while getting (or renewing) a membership, or take advantage of some awesome rewards (like a sailing excursion or a tour of Keelah's house and beehive!). If not, consider it a donation toward a space that is trying to set the standard for a new way of providing food. Long live the Manly Food Co-op!